As a thirty-something game master, I find myself torn. I love hand-crafting plots and story lines for my weekly role-playing game sessions, But as a husband and dad with a full-time job, extracurricular activities, and household chores to deal with, finding the time to tell those stories is challenge. My Three-Page Manifesto helps keep my prep times reasonable, but I can still find myself scrambling for ideas the night before the game. That’s why I’ve found the mini adventures in Star Wars: Scum and Villainy and the random adventure creation tables in The Day After Ragnarok so useful, and why I was happy to see Gnome Stew’s Eureka: 501 Adventure Plots to Inspire Game Masters arrive in my inbox. I’ve bought a few plot seed PDFs over the years, and the problem with all of them is that they contain the germ of an idea, not a full plot that I can easily run with. They’re helpful for random inspiration, but when it comes to constructing an adventure, they’re useless. The writers held themselves to a strict word count; each adventure plot fits on half a page. There are 501 of them! I know how hard it can be to write to a word count, even more so when you have to keep things detailed enough to make sense, but abstract enough to be plugged into any setting. Throw in 10 writers all striving to hit the same standard, and I can just imagine how much work it was to put this together. “Behind Enemy Lines” — in which a spy must be recovered from behind enemy lines (perfect for the Mandalorain Wars). “Spaceport Feud” — in which two rival families run starship repair businesses in a spaceport. The two have been fighting, but now there’s been a murder. “The Abel Protocol” — The heroes are trapped in a space station with systems suddenly and catastrophically failing. “Search and Destroy” — Hunting a space pirate in the depths of a trinary star system that’s home to killer radiation and surging electromagnetic storms. “Mining Planet Revolt” — Miners revolt against oppressive working conditions and escape into deep space, where they run into the PCs. It’s easily adapted from its current antagonists (an evil corporation) to the Mandalorian war machine. It’s a nice mix that took me all of 20 minutes to put together. Figure another hour or two to flesh out some adventure notes for each scenario, and you’ve easily got the makings of a six-month campaign. All of these plots would be useless if you couldn’t find them, but thankfully Eureka is exceptionally well organized. In fact, it’s the most organized RPG resource I’ve ever read. In an age when some companies cut costs by not including an index (or delude themselves into thinking people would rather have more content then be able to find that content) Eureka stands out by offering not one, but four indexes. There’s one for plots by genre (action horror, anime, comedy, romance, scifi, etc. ), plots by title (a simple A-Z list), plots by author, and plots by tag. The last index is the one I was most uncertain about — tagging is a common (and effective) technique in blogging, but I wasn’t sure how it would translate to print. The answer is … brilliantly. Each plot has a series of tags associated with it. For example the scifi plot “Lifeboat” involves an asteroid about to smash into a pastoral world. The heroes need to evacuate it, pulling together a ragtag team of pirates, smugglers and freelancers to do so. It’s tagged as “alliance, deadline, planet-based, and social”. These tags appear along with the plot, but can also be referenced from the index. This is perfect for when you have an idea of what sort of adventure you might want to run — like “shady” or “madness” — and then quickly find the plots that match that concept. The book offers other tools beyond the indexes. Each plot has an “Easily adapted to” entry listing subgenres that the plot could easily be used with. For example “Lifeboat” could be translated to anime, high fantasy, steampunk and supers. Some may be more of a stretch than others, but I appreciate having it there. The plots make use of Thirty-Six Dramatic Situations by Georges Polti (1917). Polti suggested that every story ever written boils down to one of 36 plots, such as “Crime Pursued by Vengeance” and “Self-Sacrifice for an Ideal”. 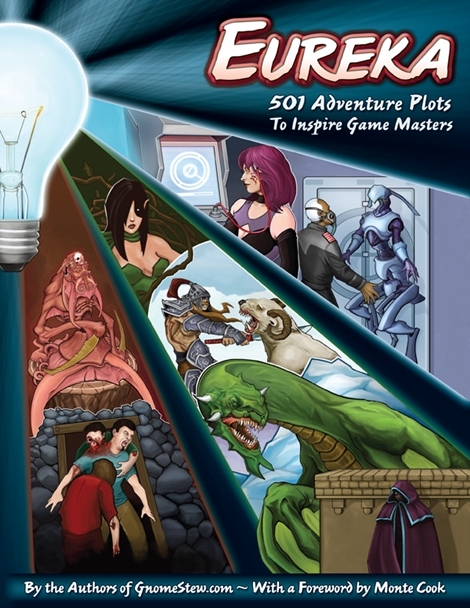 Eureka took that idea and ran with it, using it to spawn all of the adventure ideas in the book. Even if you don’t agree with Polti’s theory, it was a good approach for the book because it yielded a nice mix of plots, and as the authors pointed out, it helped keep them from accidentally duplicating their efforts. The product is available both in print and PDF; as a print product it comes with a free PDf bundle but the PDF can be purchased separately. I reviewed a free copy of the PDF, and I found the layout clean and the text easy to read. The PDF has plenty of bookmarks, but I do wish it had made more use of hyperlinking in the index. I’m sure flipping back and forth between index and a particular page is easy in the print version, but it was a bit awkward in the PDF. It’s a minor complaint though — I’ll happily take four indexes with no hyperlinking over the malnourished “list of suggestions” that some of Wizards of the Coast’s books try and get away with. The PDF is DRM-free, making it easy to cut-and-paste text from the book into your campaign notes. Gnome Stew is a role-playing game blog dedicated to offering system-neutral advice for game masters. With Eureka, they’ve taken things beyond advice to create an excellent resource for time-strapped GMs, while simultaneously managing to avoid the sort of traps (such as ignoring indexes) that other publishers have stumbled into. Is it worth the $34.95? That depends — what’s your time worth to you? And how much of it do you have to spare each week (or month) writing an adventure? If you’re like me, then the answers are “a lot” and “too little”, leading me to the conclusion that Eureka is well worth picking up.